When talking about Bible study Apps, we refer to those resourceful apps that are specifically designed to help us understand the contents of the Bible. Also, the best Bible study app must be straightforward to use (have an intuitive interface). These days, a lot of persons find it somewhat stressful to move along with the physical Bible due to the size or some other personal reasons. Most especially, with these Bible study apps, you could engage yourself with the Word of God virtually at anywhere and anytime. Hence, the need for a Bible app is quite inevitable for a real Christian. Here are the best Bible Study Apps for Believers to keep up with their quiet time, faith, and engagement with this blessed Word of Life. This is one of the most popular audiobook platforms; it reads out audio with a real, clarified human voice. Also, it has the ability to save data of your last tasks to continue with them later on. Audible is seamlessly compatible with both Android and iOS devices. Multitask for background downloading and listening. Even so, this app includes quite a lot of Bible story for kids, all with Animated cartoon Characters. The Bible app by Life Church is arguably the best Bible study app you’ll ever need. It comes with both Audio and offline access which makes it more unique and easy to use any time and anywhere.there are 1400 versions in a variety of languages. You can read whatever version you want. It also comes with a Verse of the Day and more. Some of the versions it comes with include audio versions of the Bible, the King James Version, The Message, New International Version, New King James Version, NASB, New Living Translation, English Standard Version, Yoruba, Zulu, and others. That makes it one of the more powerful Bible study apps also. Popular versions: King James Version KJV, New International Version NIV, New King James Version NKJV, New Living Translation NLT, English Standard Version ESV, NASB, Revised Standard Version RSV, New Revised Standard Version NRSV. Switch between 1,400+ Bible versions, 1,000+ languages. This is a unique App that adds fun to our Christian life. With over 100,000 quiz question from the Bible prepared just to make our daily lives eventful. It can be played with our family and loved ones and can also be shared on our Facebook timeline to see our progress and that of our friends. Check in every day to gain bonus and try lucky spin to bring you good luck. A mystery box will be acquired once you complete the ten Bible trivia games. Daily Bible verse as the name goes is a unique app that displays bible verses randomly on a daily basis which helps Christians to keep in faith with their Christian life; you can also choose to use the KJV or NIV depending on your understanding. It’s a straightforward app to use, and it’s also free. 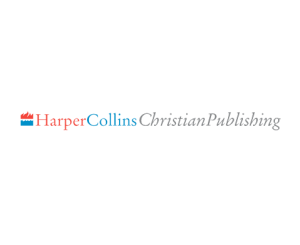 The HarperCollins Christian Publishing is a collection of various Bible and Bible study app the unique app enables you to access multiple bible apps like KJV, NIV, ESV, NTL versions. You can also access the Amplified Bible and other Bible study app. 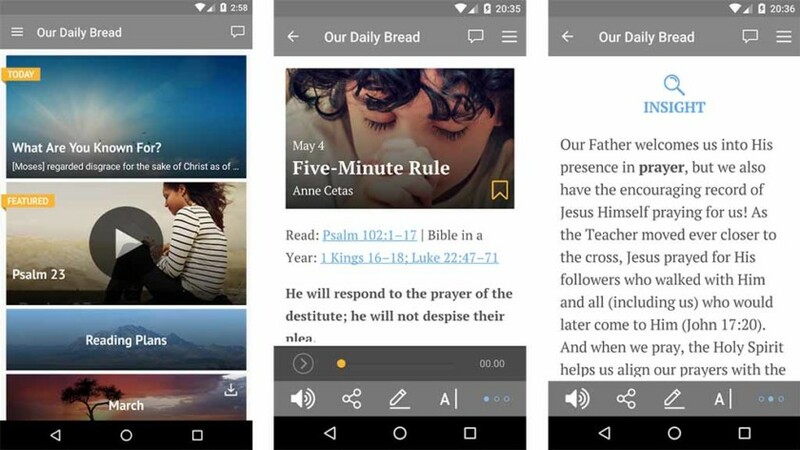 Our Daily Bread is an app designed by a Christian group that begins in 1930. They have written a lot of Christian inspirational books that help us develop our spiritual lives, with the unique features it allows you to read lots of Gospel Magazines that enables you to grow in our Christian lives. It also reminds you daily to study a spiritual book you have chosen to on a daily basis. Bookmark your favorite daily readings and capture your thoughts in your private journal. Discuss daily readings with other Our Daily Bread readers in the public comments. Download a month of daily readings at a time for offline access. Share daily readings with your friends by email and social media. Listen as you read with the built-in audio player. The Beginners Bible by Zondervan is a unique bible app design to add fun to our kid’s daily lives. This is a bible app that comprises of the bestselling bibles storybooks with over 128 bibles stories in it. It also comes with a unique Audio function that can read stories for the children for those having challenges of reading. It has the offline mode which enables you to read when you are offline. Lots of inspirational Bible story. The study Bible App is one of the best most download bible app that gives an understanding of the new testament. It has a collection of both NAS, ESV and KJV versions of the bible. It also has a unique feature of questions answered by Bible scholars and lots more. The study Bible comes with both the free and premium version. Highlight Bible passages, add your own study notes and bookmark verses. English Bible Translator is a Bible app that helps to translate some complicated verse of the bible that was not written in English word. It has access to all versions of the bible and can translate from Both Greek and Hebrew to simply English for our understanding. it has both offline and online mode. It also comes with Audio features that enable you to listen to the word translated. Show or hide verse number. 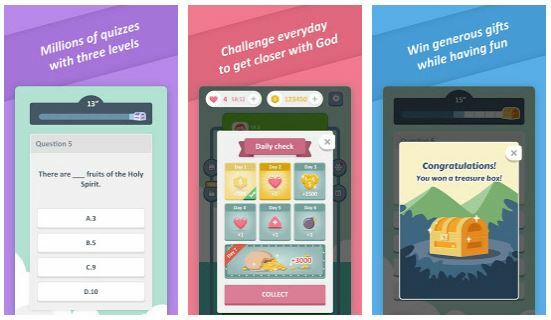 These are super fantastic bible study apps to improve your daily Christian living and regular walk with God! Do you have other lovely bible study apps you’d like to recommend? Tell us about them below.